Hawaii. The location is idyllic, the weather is nice year-round, and it is known for its fun, laid-back culture. But as much as I love Hawaii for some of those reasons, they can make for difficult church planting soil. I grew up in Aiea, which is on the Hawaiian island of Oʻahu. My parents live here. My sister and her family live here. My grandparents live here. Many of the friends I had growing up still live here. This is home. And that is the exact reason why I wanted to be a part of seeing the Gospel proclaimed in this area, and why I felt the Lord calling me to plant Victory Aiea, which officially launched in 2013. Despite decades of connections & relationships it’s been difficult to gain momentum. But God can bring growth. Not only is Aiea home for me, but it is also home for nearly all of the 20 individuals on the core team at Victory Aiea. Combined, we have decades of connections and relationships in the area, resulting in a church that is full of locals primarily reaching unchurched (and often unbelieving) locals. And as obvious as this sounds, we’ve found that non-Christians don’t like to come to church. It’s been difficult to gain momentum and translate relationships and respect to church attendance. But, we continue to work the soil, deepening relationships in the community, knowing that it is God who can (and we believe will) bring about growth. From day one, our church has been deeply involved in the local community. One of the ways we’re doing that is with the local schools. Every Wednesday, I go to the local high school with a bag full of McDonald’s hamburgers. A teacher I know allows me the use of her classroom during the lunch hour to feed and simultaneously preach to about 40 kids, some of which I believe have come to know the Lord since we began. Last fall, our church provided backpacks filled with school supplies to a couple of local elementary schools, one of which has 80% of students on reduced lunch, living below the poverty line. That school is also near a housing project with a recreation center where we’ve done some events, and in which we plan to invest more in the future. The elementary school my kids attend is where our church meets each week. We have many relationships there as well, and I volunteer there weekly. Though gaining traction among locals has been difficult, it has been a blessing to see transformation occur in the lives of some involved in our church – even among those now looked to as leaders in our body. When Victory Aiea was in the beginning stages, I reconnected with old friends of mine, Grady and Michelle. * Their marriage was in shambles, and they were seriously considering divorce. Over time, they both became Christians, which thankfully resulted in a saved marriage. 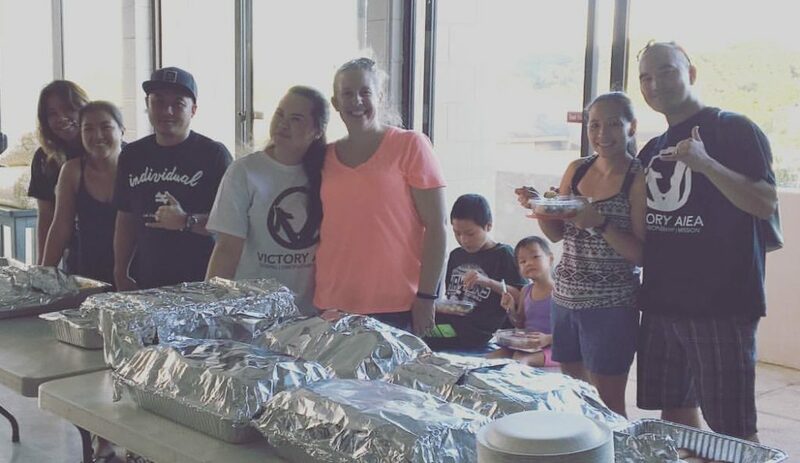 They have both been involved in Victory Aiea ever since, and Michelle now leads our kids’ ministry. Another member of our church, Ben,* also grew up in our city. While Ben was in high school, he gained a notorious reputation which led to influence in the city in ways that were not positive. In a dramatic change of events, Ben’s brother invited him to church and Jesus saved him. I met Ben nearly 15 years ago, shortly after he became a believer, and began to disciple him. Currently Ben is a member of Victory Aiea and in the process of becoming an elder. He preaches in our Sunday gathering about 12 times each year. Ben’s natural leadership abilities, and love for Jesus and his church, will likely result in Ben leading or helping lead future church plants. Ultimately, we know that it’s God that changes hearts, so pray he does that. As you pray for Victory Aiea, pray for momentum. We need people to come and commit. We’re getting closer to a critical mass, but please pray that God would send more who want to be involved in this work. Pray for strong, existing believers to join our body to provide stability as we continue to put significant work into friends and family that are non-believers. Ultimately, we know that it’s God that changes hearts, so pray he does that. Dane graduated from Mid Pacific Institute and also earned a bachelors degree from The University of Hawaii. Dane is the husband of Liz and and the father of Ben (5) and Alexa (3). Dane has served on various church staffs for the past 12 years before joining the Victory Aiea team. Dane grew up in Aiea and has been reaching out to the youth of the community for many years as a youth pastor. Dane currently serves Victory Aiea as lead pastor.